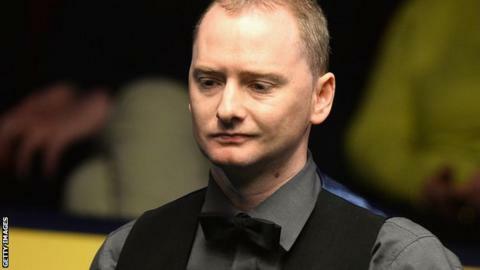 Former world champion Graeme Dott will miss this year's tournament after losing 10-7 to Kyren Wilson in the final qualifying round in Sheffield. The 2006 winner led 6-4 but 22-year-old Wilson, 89th in the world, took six of the next seven frames to claim the win. It means the Northamptonshire-born player will play at the Crucible for the first time in this year's tournament, which begins on Saturday. 'I'm going to drive past the Crucible now and have a look," said Wilson. "I've been there to watch my friend Peter Ebdon in the past but it's going to be a bit different playing there." It is the first time Dott, 36, will be missing since 1999. "Kyren played really well and deserved to win," Dott told BBC Sport. "I didn't play that bad. "For his first time qualifying, he handled the pressure really well. "I'm not overly disappointed just now but I'm sure when the tournament starts on Saturday I'll be devastated that I'm not there." There was some good news for Scottish fans though as 43-year-old Alan McManus caused a shock by beating two-time winner Mark Williams 10-8.